In your integrated Masters year, you’ll develop advanced research skills by working alongside our world-leading staff in Chemistry on ground-breaking discoveries. 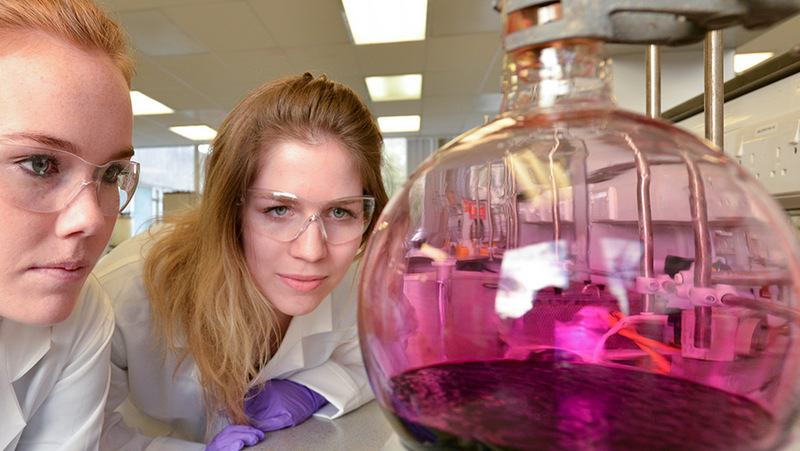 You can also apply for a year working in industry, gaining experience of chemistry in the workplace. We also offer this course without the industrial placement year, with summer research placements, or as a three-year BSc. Find out about the benefits of an integrated Masters year. A-levels must include Chemistry, at least grade B. You will also normally need to pass the separate science practical assessment in Chemistry. If you are not able to take the science practical assessment, applications will be considered on a case-by-case basis. The Access to HE Diploma will need to be in Science and contain substantial amounts of Level 3 credit in Chemistry. You may wish to consider taking A-level Chemistry in addition to the Access to HE Diploma. A-levels or Cambridge Pre-Us must include Chemistry. You will need an A-level in Chemistry, grade B, in addition to the BTEC Level 3 National Extended Diploma. Highers must include Chemistry, grade A. Ideally, you will also have an Advanced Higher in Chemistry (grade B). A-levels must include Chemistry, grade B. Evidence of existing academic ability in Chemistry is essential (normally with a final grade of at least 8.0). Pass Ylioppilastutkinto with overall final result of at least EEEE, which must include Chemistry. You will need a very good final result in Chemistry (at least 12/15). Apolytirion with an overall average of at least 19 will be considered for first-year entry. You must also have either Apolytirion pathway in Chemistry with a score of 19 or the Pan Hellenic in Chemistry with an overall score of 17. Sijil Tinggi Persekolahan Malaysia (STPM) with grades of AAA-AAB, Matriculation with a least a grade of 3.5 or UEC with an overall average grade A2- B3 (80%-75%). Pass Matura with least 3 Extended level subjects in the 80th percentile including Chemistry. Diploma de Bacalaureat with an overall average of 8.7 including a score of 8 in Chemistry. Spanish Título de Bachillerato (LOGSE) with an overall average result of at least 8.0-8.5. Fullstandigt Slutbetyg/Högskoleförberedande Examen with a total of 2,500 credits to include A and B grades in the majority of subjects and to include grade B in Chemistry. Advanced Placement Tests with scores of 5,5,5 -5,5,4, in three subjects. You can apply to spend up to one year away from the University on an industrial placement, normally either in the UK or Europe. During this year you take three distance-learning modules, supported by regular contact with a designated tutor.